Note Ban: India's Surgical Strike On Pakistan's Economic Warfare? Rs 500 & 1000 Note Ban: India’s Surgical Strike On Pakistan’s Economic Warfare? On 8th November 2016, The ruling NDA government led by Prime Minister Narendra Modi, boldly proclaimed the ban of Rs 500 and Rs 1000 note as legal tender by midnight the same day. This announcement came as a great surprise to the people of the country who were caught unawares by this immediate implementation of the ban. The main question being asked now is ; what prompted the government to this drastic step? Why ban Rs 500 and Rs 1000 currency note from circulation? What could the government and the people of India gain by banning these currency notes? To answer this question in one sentence, modern warfare is not just fought by foot soldiers on the ground, but also by men with money in high places. Why ban Rs 500 and Rs 1000 currency note from circulation? Right now we are in a state of passive-active war along our borders with our neighbour Pakistan but border skirmishes are not the only ways of waging war. The modern warfare tactics being employed on India is economic warfare! In recent times the problem of fake Rs 500 and Rs 1000 notes has grown so bad that Shaktikanta Das, the Secretary for Department of Economic Affairs, estimates between 2011 and 2016, there has been a 76% increase in the circulation of fake Rs 500 notes and a whopping 109% increase in fake Rs 1000 notes! On average Rs 400 crore worth of banknotes are in circulation in the country at any given point of time, and Rs 70 crores of fake money are added to the economy every year! How is fake currency entering into circulation in India? According to reports by IB, RAW & CBI, the influx of fake of Rs 500 and Rs 1000 fake currency is mainly through the porous India-Bangladesh border, India-Nepal border and by sea through India-Sri Lanka sea routes in boats and trawlers. The currency itself is printed in in Pakistan and the whole operation is managed by the Pakistan’s Inter-Services Intelligence (ISI). This currency is then distributed to the agents of the counterfeit currency ring, who deviously inject it into the economy by transacting the currency at crowded and busy business institutions like hotels, Petrol bunks, Railway stations and Supermarkets where the chance of the notes being scrutinised are less. 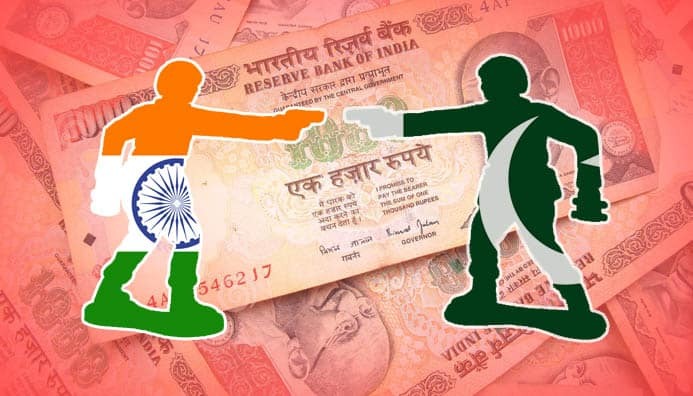 By giving the fake Rs 500 and Rs 1000 note for their transactions and receiving genuine currency back, these agents are able to inject fake currency into circulation while simultaneously making a profit. This profit is then used to fund terror outfits like the Indian Mujahideen to carry out terrorist attacks within our border. These are the reason that drove the Reserve Bank of India to demonetize the Rs 500 and Rs 1000 currency note. This is to defend India against the economic warfare being waged against it, which brings out our next question. How does fake currency impact the economy of our country? The short version of this answer is, when fake currency is introduced into the economy, the supply of money increases and accordingly inflation increases. Let’s see how this works. When more money flows into the market, It increases the purchasing capability of the people (more money in hand). Since people have more money, they have more purchasing power and thus demand for goods would increase. Unless the increased demand for goods can be matched with an increased supply of goods, then the price of commodities will increase. This is assuming that fake currency has not been detected by the market.When fake currency is detected, another scenario plays out. Check out this example. A man buys apples for Rs 100 from a fruit seller using fake Rs 100 note. The fruit seller goes to the bank to deposit this money in his name. However, the bank recognizes the fake currency and refuses to acknowledge its value. Thus, the fruit seller has now lost Rs 100 worth of goods for nothing in return. For recuperating his loss, the fruit seller would increase the value of his other products. When this effect happens on a large scale, that’s when we get inflation in price of commodities. A combination of the above factors would play out in the market and lead to an inflation situation. If the fake currency problem is really bad, then it might result in a risk of loss of confidence in the Rupee which is a really bad scenario where even the social order of the country can break down. So now that we know much a trouble counterfeit notes can cause, let’s analyze how this announcement solves that problem and its effect on the Indian public. How does this ban tackle the fake currency problem? The high volume of fake currencies comes from the Rs 1000 and Rs 500 note. Fake currencies of lesser denominations like Rs 100 and Rs 50 exists too but the bulk of it, is from high value denominations. To stop the supply of fake currency from the source itself is going to be an almost impossible task, which is why the government has gone after the currency notes itself and taken them out of circulation. Apart from the ban, the government is pushing people to go cashless and adopt electronic modes of payment like swiping their debit/credit cards for transactions or using mobile wallets like Paytm, freecharge, Chillr and mobikwik etc. Fake currency problem can only be eliminated completely when currency notes are no longer used and the steps taken by the government are a push in that direction. In the next part of this series on the Ban of Rs 500 and Rs 1000 notes we will talk about what is the impact of this announcement on the common people, how it’ll affect the Indian economy and the Parallel economy based on black money.